The book ends with a study of Quentin Tarantino’s film Django Unchained. This final chapter acts in part as a response to Carolyn Dinshaw’s groundbreaking study, Getting Medieval: Sexualities and Communities, Pre- and Postmodern. Her provocation to think about what it means to “get medieval”—borrowing the line from Tarantino’s Pulp Fiction—ends with a return to the film itself. Dinshaw found the film to be lacking in terms of how it deals with sexuality, particularly homosexual relationships. Django offers the ideal impetus to revisit the project of reading “the medieval’s” relationship to radical readings of contemporary issues through the film’s reassessments of race relations and the Siegfried myth. Vernon argues that Django adroitly utilizes the flexibility of medieval mythology to question the presentation of African-Americans within the founding narratives of the nation. 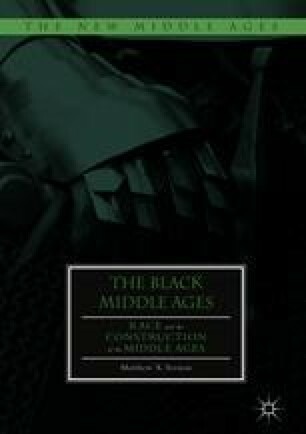 This final chapter demonstrates the longevity of the questions at stake through the entirety of The Black Middle Ages. Coates, Ta-Nehisi. “The Case for Reparations.” The Atlantic, June 2014. Accessed August 10, 2017. https://www.theatlantic.com/magazine/archive/2014/06/the-case-for-reparations/361631/. Platon, Adelle. “Spike Lee Slams Django Unchained: ‘I’m Not Gonna See It.’” Vibe, December 21, 2012. Accessed October 20, 2017. https://www.vibe.com/2012/12/spike-lee-slams-django-unchained-im-not-gonna-see-it/. Stefansky, Emma. “Sofia Coppola Responds to The Beguiled Backlash.” Vanity Fair, July 15, 2017. Accessed August 10, 2017. https://www.vanityfair.com/hollywood/2017/07/sofia-coppola-beguiled-racism-backlash.